ONE OF the things I like about flying is the onboard fun that I can look forward to—the movies and the music, to be more specific. At my age, and with all the mucking about that I’ve done, I should be sick of these things and ply myself insensible with the free beer or wine somewhere between Anchorage and Nagoya, but the honest truth is, I’m not. I’m eager for entertainment, which is the only way I can forget the fact that I’m going to be up in the air for the better part of a 24-hour day. I don’t have a fear of flying; it’s boredom I can’t abide. Being up there means that I can catch up on all the movies I never saw and didn’t even know existed. Beng and I almost always take in a movie after our weekly foot massage (such is life in the 60s), but we’re slaves to what’s out there, and not being too much of a cinephile I’m positive I’m missing out on the good stuff by sticking to the mall fare. That changed last week when I flew home from Dulles airport outside of Washington, DC to Terminal 3 on the fringes of Pasay—a distance of 8,548 miles, according to Google. That meant 11:30 hours of self-amusement to contemplate, but I think I hit the jackpot—a trifecta in sporting terms—by watching three great movies on one long trip (I actually saw four, but I don’t think Hercules: The Thracian Wars is going to win the Palme D’Or). I just enjoyed the presentation the first time I saw it, but this second time, I was furiously scribbling away on my notebook with a fountain pen in the half-light, as Stephen Sondheim spoke about the creative process behind six of his best songs. Anytime you see me taking notes, it has to be that good, so I’m going to save the best of Sondheim for another column, which the material richly deserves. But just for starters, this was the man who wrote the lyrics and libretto for West Side Story when he was 25—a task he chafed at, wanting to do the music instead—but it proved to be a great learning experience, and Sondheim would go on to become a master teacher himself, like his mentor Oscar Hammerstein II and West Side Story collaborator Leonard Bernstein. It was Bernstein, come to think of it, who once said that “Music is the only art incapable of malice,” which makes a good segue to my second choice, a film suffused with malice but whose central character, played by the Briton Tom Hardy, exudes an odd naivete. I’ll spare you the spoiler, but The Drop is as quiet and as deliberate a murder mystery as they come. Set in a bar in Brooklyn, The Drop has no car chases, no photogenic panoramas, and co-star Noomi Rapace puts it best when she squirms and says “I don’t want to be here.” We don’t, either, but we can’t help staying and looking, because we fear for the safety and the happiness of our unlikely hero, a quietish bartender who seems intent only on saving damsels and dogs in distress—at least until he draws a severed arm out of a bag; but I’ve already said too much. And Tom Hardy makes a good segue to the last item on my playlist, which I watched on the Tokyo-Manila leg. He doesn’t appear in it, but is quoted—or I should say more than quoted, because we hear his voice again, speaking like a head in a paper bag, coming out of the mouth of someone who looks nothing like Tom Hardy, the British comedian and mimic Rob Brydon. The movie was the rather tepidly titled The Trip to Italy, and the only reason I bothered to click on it was because I mistook it for a travelogue that would take me back to some postcard-worthy renditions of Tuscany and Umbria. Of course—away from the neorealism of Fellini and his crew—nearly anything in Italy is worth a postcard and indeed a book. 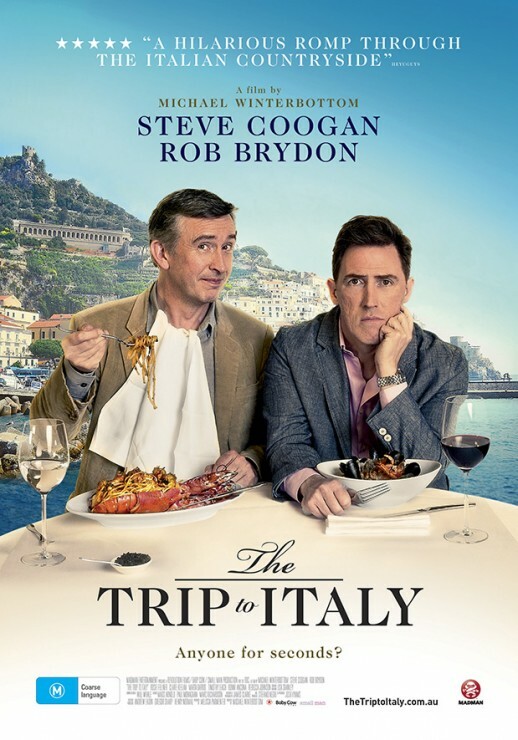 That’s the burden of Brydon and his fellow comedian and travel companion Steve Coogan, who get sent on assignment as their real selves to trace the footsteps of Byron and Shelley in Italy while feasting on veal and artichokes and an endless parade of smart brunettes. It’s a road movie and a buddy movie all at once, but it’s not Easy Rider or Butch Cassidy and the Sundance Kid. Real men don’t tool around the countryside in a Mini Cooper, twirling pasta on their forks while quoting the Romantics (“romantic poetry” to most guys comes with a small “r” and is best represented by Kenny Rogers and Michael Bolton). The Trip to Italy is the kind of talky romp that fans of that taciturn trio of Seagal, Stallone, and Schwarzenneger would absolutely hate. Ninety percent of the movie is conversation—make that intelligent, hilariously intelligent conversation, and 50 percent of that 90 percent is comic impersonation, with the two guys doing their irrepressible impressions of Michael Caine and Marlon Brando, making Coogan and Brydon the Dwayne Johnson and Vin Diesel of roadside repartee. But for all the silly banter, there’s a poignance that underscores this movie that seems to be going nowhere, except deeper and deeper into the male psyche. I thought I was up there for a load of entertainment, but instead I got a dose of inflight education. I can think of far worse ways of killing time. 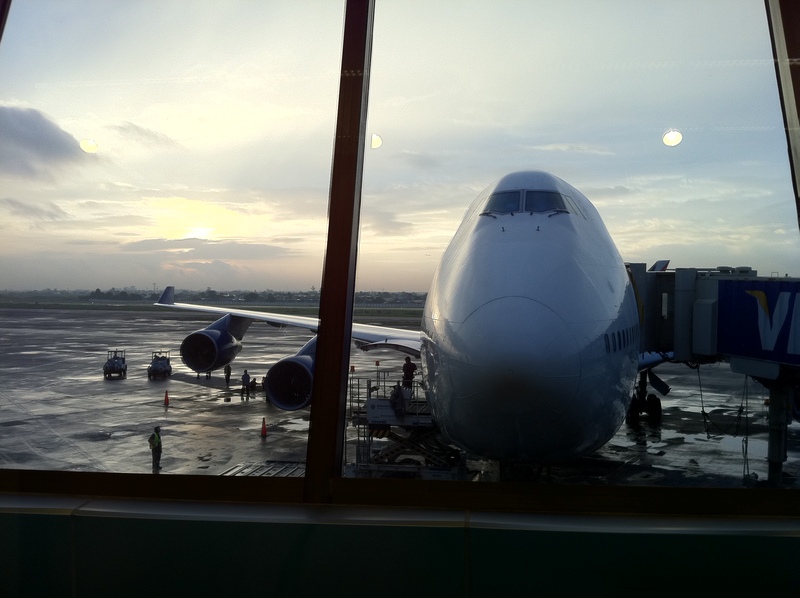 This entry was posted in Art & Culture, Education, Fun, Travel and tagged entertainment, inflight, movies, Sondheim, travel by penmanila. Bookmark the permalink. Same her Prof., this past year I watched “The Grand Budapest Hotel” flying back home from Sidney and “The Trip to Italy” flying back home from Vladivostok. Both are nominees for SAG Awards. “The Trip to Italy” is a BBC series so basically it’s a Cinema Cut. The first season was “The Trip”, it’s something only BBC can make. Now, an addition to my bucket list is to be able to do a credible impression of a favorite movie scene. Welcome back!